The WU28 Traditional Wall Clock is equipped with an extremely reliable and precise German mechanical movement, with a power reserve after winding up of eight days, just over one week. The clock has a half hour striking mechanism, with strikes counting out the hours and a single strike each hour. This striking mechanism can be switched off if desired. The WU28 Traditional Wall Clock has a hand painted metal dial. This clock is built to order and not a stock item that can be returned. They are hand made for delivery in four to six weeks from ordering. Clocks & Chimes will let you know by email if there is any likely production delay. If you would like to receive notification of the deliver from the carrier, please include a mobile telephone number when placing your order. 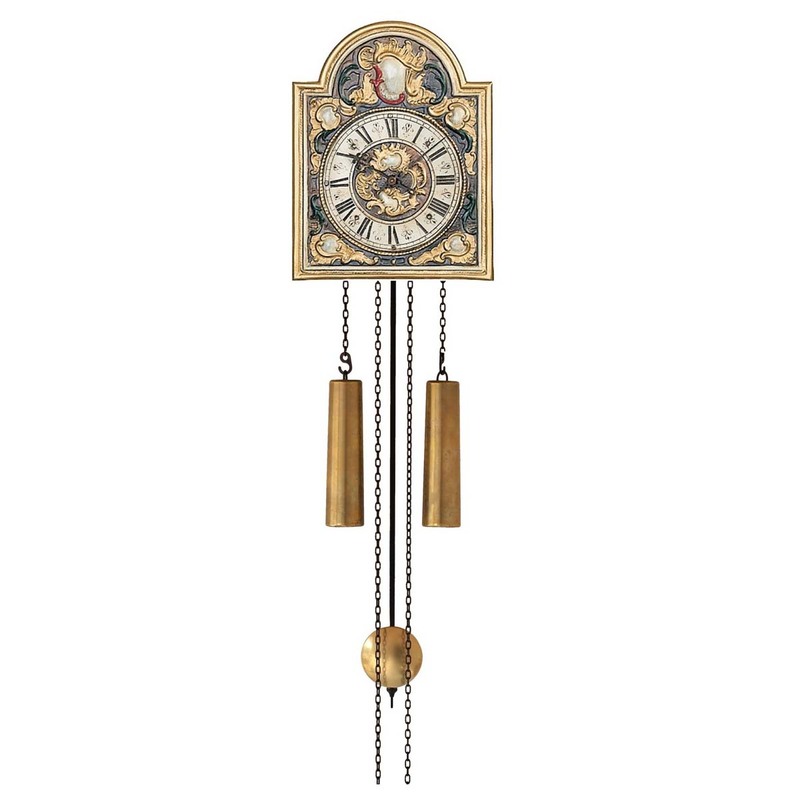 The clock’s chains are in dark patinated brass (nearly black) and the weights and the pendulum bob have an antique brass finish, for an authentic look. This clock is built to order and is not a stock item that can be returned. They are hand made for delivery in four to six weeks from ordering. Over 30 years ago Helmut Mayr, from Andechs in Stanberg, Bavarian (renowned for its pilgrimage Abbey and brewery), set out to enrich the clock market, which was – and still is, dominated by mass-produced clocks from manufacturers focused on cheap production. He did this by embracing traditional manufacturing techniques, making a return to the days of master clock makers, with craftsmen utilising the highest quality components and cases. The company today – Helmut Mayr Uhren GmbH, is located in Schramberg in the Black Forest, and is wholly committed to this philosophy. At this new location, which was once a centre of watch production, they design, develop and manufacture a range of high quality mechanical timepieces. Their traditional decorative pendulum wall clocks are chain driven, with ruby and miniature ball bearings, these precision manufactured components guarantee a high degree of reliability and longevity; consequently producing a sustainable product that fits more than ever in our time – classic products for 21st century living, which are likely to become a much loved future family heirloom.